For me there are two factors above all else that determine the talent of an MC. Their abilities in the studio are clearly important, but also their capacity to rock a live show. I have seen groups such as the Cool Kids–that while I love their music, didn’t have a great live show. I still enjoy the Cool Kids and listen to their music often, but would think twice about paying to see them again. To a certain extent, a Hip hop show is expected to be loud and you’re supposed to feel the thump of the bass in your chest. However, with the Cool Kids it was impossible to hear their lyrics, and difficult to figure out which song was being played. 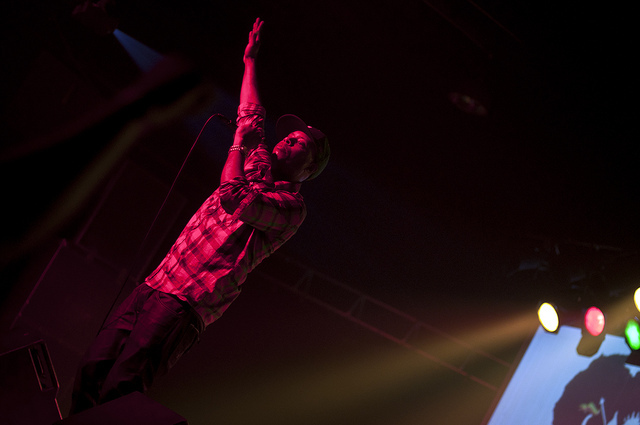 Recently, I saw Talib Kweli at the Pyramid Scheme in Grand Rapids, Michigan. To put it simply, the night was a bit wild. About halfway through the set he apologized to the crowd for being late and explained what had held him up. According to Kweli, he had three different flights cancelled out of New York due to the east coast blizzard. Because of this, he took a taxi down to Philadelphia, flew to Detroit, and then was driven from Detroit to Grand Rapids. I can only imagine how exhausted I would have been after such a travel fiasco. Despite this, Kweli came straight from the road to the stage and had the crowd rocking with him within his first song. He left the stage with huge cheers from the crowd that quickly became a chant for him to return. After about five minutes he came back and did about six more songs that included his verse from the Kanye West classic “Get Em High” and finished the encore with “I try” from his 2004 album The Beautiful Struggle. With that, the concert ended and my friends and I headed home, later than anticipated, but in awe of what we had just seen. I realized on the way home that I had just witnessed Hip hop in its purest form. Talib Kweli was able to find energy to perform after a long day of travel because sharing stories with an audience is his craft. Beyond that, rapping is his vocation. He has reached the point in his career where his lyrics are not simply “memorized,” rather his words and lyrics are a part of who he is. Talib Kweli was able to share his artwork with crowds across the country because he understands that an important part Hip hop is engaging a crowd while spreading the messages of revolution, decolonization, love and progress. This is not a mainstream message, and will not be heard on the radio, which is what makes Kweli revolutionary in his own right. We will have a Twitter up and running in a week or two! I apologize for not having one now, but we’re only two issues in and still trying to sort everything out, but I appreciate your feedback and nice words, it really means a lot. i think peeps in the uk jock Kanye far too much. Everyone mocked Snoop for Sexual Seduction but as soon as Kanye statrs doing the singing everyones like kanye pushes so many boundaries blah blah blah’. Hes a hot producer and got 3 good albums, the first being a classic. But he aint as great as yall hype him up to be, hell id take Lupe and Common over him any day.